For car enthusiasts, powder coating can provide both a protective and a stylish finish to many vehicle parts, making it a go-to choice for durable customization. Powder coating is stronger than traditional paint, making it a preferred finishing option for metal parts that need to withstand the elements. Though different in application than paint, powder coating still offers as many color and customization options. For example, chrome powder coating offers a sleek appearance for running boards, grill guards, and mirror covers. 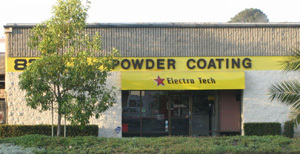 Why Choose Electro Tech Coatings? shifts so that we can complete projects quickly without sacrificing our commitment to quality work. We know that powder coating, especially when it comes to your vehicle, is an investment, and we are ready to show you why this finish is well worth it. To learn more about our services, or to get an estimate on your project, contact the Electro Tech team today.